Fast on land, fast in the water. This new car-boat is what the Amphicar should have been. To a kid in the early 1960s, the Amphicar was the coolest car in town. Well, one of the coolest. Remember the Amphicar? 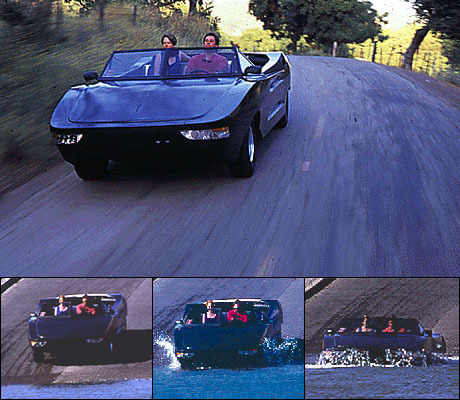 It was a little convertible import (called a foreign car back then) that ran on land and water. It performed neither operation well, but it caused quite a stir when driven down the launch ramp and into the water. Today, the West German-built Amphicar is a curious footnote in automotive history. It ceased production in the 1970s, but the dream of a dual-medium vehicle has never died. There have been several attempts to build a better Amphicar in recent years. Two that come to mind are the French-built Hobbycar and the German-built Amphi-Ranger -- neither of which made much of a splash. The most recent entry has a better shot at succeeding. It's called the Aquastrada Delta, an amphibious vehicle built by a group of entrepreneurs form Northern California. Like a typical Silicon Valley skunk-works project, the model tested for this story is a proof-of-concept vehicle that's been assembled on weekends and nights by a dedicated team of gearheads. This project is the brain child of Jack Musetti, formerly the Customer Service Department Manager at Millennium Systems, Inc. Musetti began building the prototype in his one car garage. Soon he had volunteer help from his brother-in-law, Gary Gere, a computer programmer at Gupta. Musetti solicited funding to found Aquastrada International Corp. from acquaintence Ray Ramsey, a used car salesman. Musetti solicited help for managing and completing the project from Russell Holder, a staff engineer at Compaq Computer Corporation. Musetti, Gere, Ramsey and Holder are the names on the three resulting patents. Musetti began the Aquastrada project with a simple idea: Instead of building a car with marine capability, build a car that's really a boat. This is a completely different approach from that taken by Hans Trippel for the Amphicar. The Amphicar was not only underpowered for the road (with its 43-hp 1.2 liter 4-cylinder Triumph engine), but it had a top speed of about 5 mph in the water. For a trained racer like Musetti, any vehicle worthy of a wrench has to be fast. In this case, fast on land and fast on water. To accomplish this feat, Musetti started with a truck engine -- a marinized 351-cu.-in. 245-hp Ford Windsor block. To this he mated a Ford C6 truck transmission. From here, things get creative. The Amphicar achieved marine propulsion by running two prop shafts out of the transfer case. Steering was controlled (suggested, really) by using the front wheels as rudders. Ford truck engine, transmission and transfer case comprise the powertrain. Musetti improves on these systems by using a Dominator jet-pump engine instead of props. This not only delivers impressive thrust, but swivels from side to side to achieve true marine steering. Power is delivered to the jet pump through a Ford Bronco 4wd transfer case, which is installed upside down. The shaft normally used for 4wd gearing now runs to the jet pump. At the push of a button, the Delta goes from 2wd to jet drive, or both. For steering, a standard rack-and-pinion unit is fitted with cables that run to the jet pump. The result is that steering on land and water is accomplished by using the same wheel. Externally, too, the Delta is a different animal from the Amphicar. The body is basically a standard fiberglass hull made with a layer of foam coring for stiffness and a shallow-V bottom for improved tracking and getting up on plane. Without doubt the crowning achievement of the Delta is a retractable suspension that pulls the wheels up and into the hull. This system accomplishes its unique feat by using split axles and a sleeve-and-rail structure connected to the suspension mounting arms. Pneumatic servo units pull the suspension arms inward, which has the effect of raising the wheels into dedicated compartments. In this position, seals make the wheel wells watertight. Pneumatic rams slide suspension arms inward and lift the wheels into the hull. The Delta had no trouble maintaining passing speed on the freeway south of San Francisco. On the water, it was able to plane and keep up with sport boats on a busy recreational lake. Performance is estimated to be 100 mph on land and 45 mph on water for production vehicles. Much will change when the Delta moves into production models in the coming months, but the specifications are projected to be as follows: weight: 2830 lb., length: 222 inc., width: 93 inc., wheelbase: 139 in., ground clearance: 10 in., draught: 6 in., free board: 30 in., retail price: $25,000 to $35,000. For anyone interested in finding out more about Delta, contact Bei Ming Wang, president of Aquastrada, at 25 E. Carmel Valley Rd., Carmel Valley, CA 93924, or call (408) 644-8091. Interestingly, I came across an Amphicar in Seattle on a recent trip. The owner called it one of the best preserved models in the country. He said, "I drove it last year. it ran great. Would you like to buy it?" Being polite, I said, "Not right now. Maybe later." "It may not be here later," he added. "There's nothing like it." Nothing except the new and improved Aquastrada Delta, but I didn't have the heart to tell him.